Countertop water filters are simple but effective devices. They require little in the way of installation, and they are easily moved from place to place. The diverter valve (A) replaces the faucet’s aerator. That’s all there is to installation. Screw off the aerator, screw on the filter’s diverter valve and the filter is ready for service. To operate the filter, turn on the cold water faucet and allow water to run into the sink. Then pull out the small knob on the diverter valve. This diverts water from the sink faucet through the small tube to the water filter housing(B). Inside the housing is a replaceable filter cartridge. Water passes through the filter cartridge, then leaves the filter through the spout (C), from which you fill your container. To turn off the filter, just turn off the cold water faucet. The diverter valve will pop back into place restoring your sink faucet to its normal operation. The classic countertop style shown above is quite versatile. 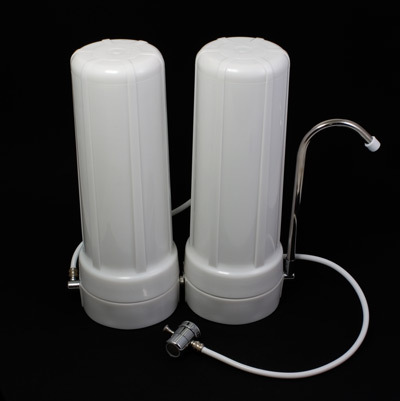 It can be made into a double or even triple filter simply by attaching single units together. Now almost all countertop units use replaceable filter cartridges, although a few of the old-style disposable units are still sold. By far the most common application of the countertop is to provide high-quality drinking water by removing chlorine and other chemicals from city tap water.This is accomplished with a simple replaceable carbon cartridge. However, by providing the proper specialty cartridge a countertop unit can be made to reduce such diverse contaminants as cysts, lead and heavy metals, fluoride, nitrates, and even bacteria. The countertop unit shown above is the classic style which sits beside the sink and has its own spout. Double Countertops offer twice the filtration capacity as well as extended treatment potential. There are other less popular styles. One, which uses the “return” diverter, has two hoses rather than one. The diverter valve sends the water to the filter then a second hose brings the filtered water back to the diverter valve to be dispensed into the user’s container. Go here for a picture of a unit with a “return” diverter. Technically, the tiny “end of faucet” filters sold in retail outlets and the pour-through pitcher-style filters are also countertops, but being purists, we’re going to confine our discussion to the two main styles described above. More about countertop water filters. “Outside of a dog, a countertop water filter is man’s best friend. Inside of a dog, it’s too dark to drink water.” –Groucho Marx.